Disney World opened on this date in 1971. Here's how the theme park ended up in Orlando. It’s easy to see why someone would choose the Orlando area for a tourist attraction these days - it’s already such a mecca for vacationers, you’d be all but guaranteed to pick up some visitors by default. But back when Walt Disney was looking for a place to create a larger, roomier version of Anaheim’s Disneyland, Orlando was mostly swampland. So what possessed him to build one of the world’s busiest vacation spots on top of a bog? In a word: Interstates. Where he was going, he needed roads. He knew he needed to build on the east coast after survey results showed him that a scant two percent of Disneyland visitors traveled from east of the Mississippi. Walt and his associates considered Niagara Falls, but ultimately nixed it because the frigid winters would prevent them from staying open year-round. They decided southeast was the way to go. With an eye on Florida because swampland was cheap there, Walt flew above the state to scout locations on November 22, 1963 - the day JFK was assassinated. At one point, he looked down and saw where the under-construction Interstate 4 was going to cross the Florida turnpike and knew he had his location. The crosspoint of two major thoroughfares and the nearby airport would make for easy access to his park. Although he had solved the problem of where to build, a new dilemma cropped up: Walt knew if he was making queries about buying land under his own name, the insanely cheap swampland price of $180 an acre would immediately skyrocket. To avoid price gouging, he created a number of fake companies and purchased the land under their names instead. It only worked for a little while, though. The Orlando Sentinel caught whiff of the scheme and published a story reporting that Walt was the man behind the purchase of thousands of acres of land in Orange and Osceola counties. He was right about the money; in some cases, prices went up to $80,000 an acre. 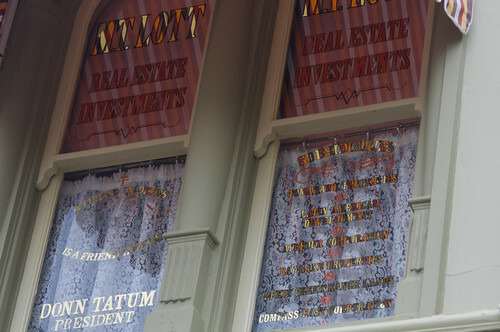 Some of the windows above Main Street shops in the Magic Kingdom pay tribute to those dummy corporations: “M.T. Lott Real Estate Investments” is just one of them. Other windows serve as tributes to real people who were instrumental in the early days of the company, or were just special to the Disney family. And in case you’re wondering how Disney managed to pull off building on top of a swamp, well... he kind of didn’t. He made a big mound of dirt from what was scooped out to make the Seven Seas Lagoon, then built his theme park on top of it. When you’re walking into the Magic Kingdom, you’re actually on the second floor. The first floor is under your feet - it’s full of tunnels and buildings that allow cast members to move around the lands without being seen.